“The Guidelines concerning statistics of cooperatives”, the first international standard on the statistics of cooperatives were adopted by the 20th International Conference of Labour Statisticians (ICLS) on 18 October. The guidelines have only 7 pages but contain core conceptual and statistical definitions on cooperatives and, in particular, work and employment in cooperatives (see general introduction of the guidelines on the ICA website). Although the guidelines cover all types of cooperatives, it should be noted that they have more significant meanings for worker cooperatives and social cooperatives represented by CICOPA. First of all, the worker cooperative model is clearly recognized as one of four main cooperative types (worker cooperative, producer cooperative, consumer/user cooperative and multi-stakeholder cooperative) which are based on different interests of members in relation to their cooperative. It is very obvious in some countries, but it is also true that in many countries, the worker cooperative model itself does not exist or is confusingly understood. Particularly, in the labour statistics, there has been a big conceptual problem with the category of “Members of producer cooperative” which had been one of employment status together with employees, the self-employed and family contributors in the International Classification of Status of Employment (ICSE-93) but was removed in the revised ICSE-18. Until recently, this category of “Members of producer cooperative” has made a serious confusion between producer cooperative model and worker cooperative model. But with the Guidelines as well as the new ICSE-18, two models would be clearly distinguished in the statistics. Second, social cooperatives might have their places in this classification either as multi-stakeholder cooperatives or worker cooperatives according to their membership structure. Although the concept of “social cooperative” itself was not included as a statistical concept, this method allows social cooperatives to find their appropriate places in statistics, which reflect variety of social cooperative models. Third, the concept of “worker-members of cooperatives” was fully recognized as a specific work form in cooperatives at its own right. In the Guidelines, “worker-members of cooperatives” are defined in referring to other concepts used in the new ICSE-18. It might be considered that the concept of “worker-members of cooperatives” obtains a citizenship in the world of statistics. However, more careful approach should be taken for understanding the content of the Guidelines in a correct way. It should be emphasized that the statistical concepts are different from legal or institutional concepts practiced in different contexts but analytical tools for measuring a reality. For example, according to the Guidelines, “worker‐members of cooperatives are dependent workers because they do not have the same degree of control over the operation of their enterprise as, for example, a majority shareholder. If these workers are paid a wage or salary for time worked or for each task or piece of work done in the cooperative, they should be classified as employees of their own cooperative; if they are paid only in profit or surplus or paid a fee per service, they should be classified as dependent contractors according to the resolution concerning statistics on work relationships adopted by the 20th International Conference of Labour Statisticians (2018).” Here, the meaning of “dependent” should be understood with caution. In statistical terms, dependent worker means that workers cannot have full control over their own work and enterprise “individually”. It does not mean that worker-members themselves are necessarily employees or work like on-line platform workers but their ways of working share functional similarity with those of employees or on-line platform workers. It is certain that this cognitive gap between statistics and institutional reality might raise politically and legally complicated issues but they should be dealt with case by case with full participation of the cooperative movement. 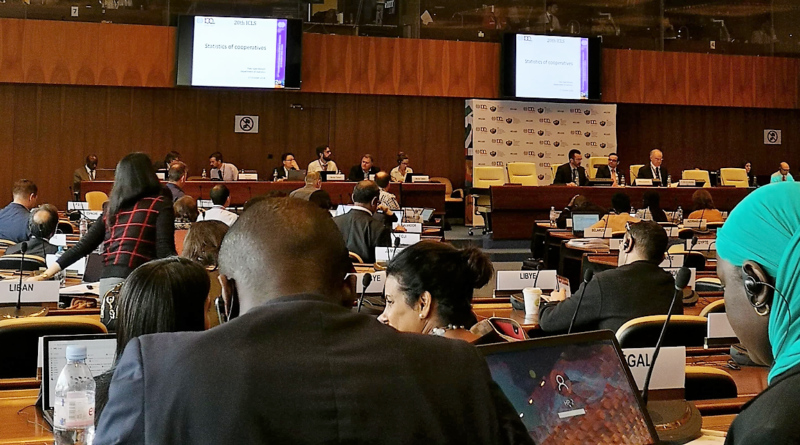 In this sense, it might be expected that the statistical concept of worker-member would be a stepping stone for reaching its full recognition in legal and institutional arrangements at the international level. Of course, it would be more realizable, when the number of worker-members and their specific advantages and contributions will be more visible. And it is the work which should be done by the cooperative movement itself by strengthening data collection and production of statistical information. The ICA will publish a commentary version of the Guidelines for the cooperative movement in order to help them to understand better the Guidelines and promote them in the data collection and production of statistical information in the cooperative movement.